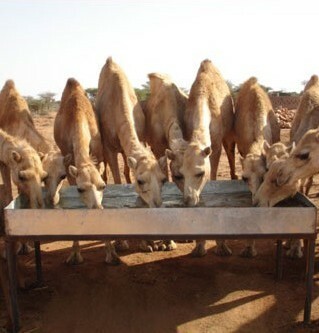 The Changing Political Landscape in the Horn of Africa ............................Revisit! This article offers a reflection on the recent developments in Somaliland’s foreign policy and the changing attitude of the international community. For a long time there has been a complete disassociation between a country’s ability to discharge its sovereign responsibilities and its claim to a sovereign status (Herbst, 1996-1997) . The international community’s continued support to give legitimacy to a non-functioning state, so as to preserve non-existing integrity is like refusing to perform an essential amputation for the sake of bodily integrity. Dhaqankii suubanaa ee reer Somaliland ee Miyiga iyo Filim caaqiibo leh oo waayo waayo ku xasuusinaya...... A Nomad Boy (1960) - ....... Bal dalkii, dadkii iyo noloshii xiligaa ee Somaliland.......Daawo. Somalilandpress- In wake of increasing a political nature of Somaliland, different directions and People are failed to differentiate. In fact, the London Summit was not the first meeting which the international community sponsored in order to hit upon a solution for Somalia’s catastrophe, but there were separate conferences which the international community met in different locations around the world for the last couple of years. Somaliland has been practicing democracy in various different forms for the last fifteen years. 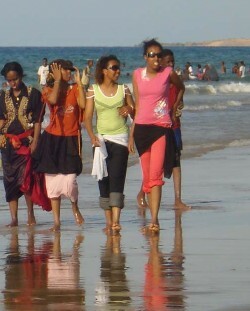 It can be said that the first phase of democratic practice in Somaliland was based on clan con sensus. The different clans resident in the country selected, according to their own methodo logy, includes the elders who would represent them in the several national conferences that were held for different purposes such as peace and reconciliation, the political future destiny of the country, or appointing further representatives in future working bodies like the Guurti, the House of Representatives, and members of the Government. 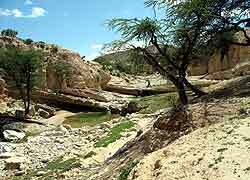 The Republic of Somaliland is situated in the Eastern Horn of Africa. It has internationally recognized borders, which were clearly demarcated by the British and that separate it from Somalia, Ethiopia and the Republic of Djibouti. Somaliland became a sovereign country after its independence from Britain on June 26, 1960. It was then known as the Republic of Somaliland and was recognized as sovereign country by 36 member states of the U.N.O. Let us work together and focus on the future for a better Somaliland. 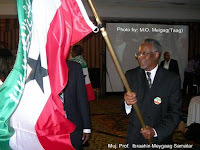 Somaliland American Guild: If the AU isn’t willing to act then the International Community must! Since the Republic of Somaliland restored its independence from the failed Union with the former Republic of Somalia in 1991, Thirty three (33) new countries have been recognized. The majority of these countries were in the Soviet Union and Yugoslavia and two (2) in Africa; Namibia (1991) and Eritrea (1993). South Sudan, which officially hasn’t even declared independence (will declare July 2011) is already promised recognition by the United States and other powers. Somaliland must not be beheaded! Dont do it. The people of Somaliland, whose flag displays the same Islamic shahaada (i.e. “There is no God but Allah, and Muhammad is the Prophet of Allah”) as the flag of Saudi Arabia, demonstrated that democracy can be welcomed and embraced by Muslim populations and in regions historically beset by terror, violence, poverty, and corruption. The example Somalilanders set by their own volition should serve as an inspiration to oppressed populations around the world and be applauded by the United States. 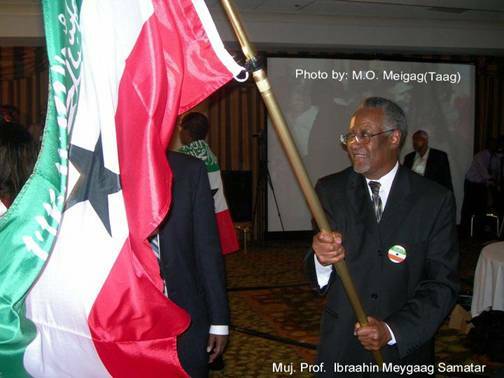 Position of the Republic of Somaliland on the Djibouti Peace Initiative on Somalia. On 1 July 1960 two separate and sovereign territories - Somaliland (a former British Protectorate) and Somalia (the former Italian Somalia) formed a political union that was officially named the Somali Republic. The Somali Republic, as such, became a member of the United Nations, the OAU, and a host of other intergovernmental organizations and was registered under that title.The official title of the union did not last long, as had been the case of other constitutional arrangements that were intended to safeguard the interests of Somaliland. Taking advantage of their majority, the representatives of Somalia lost little time in dropping the official nomenclature of the union and replacing it with the name of their own territory - Somalia. Addis Ababa, February 13, 2011 (Ezega.com) — In a demonstration of good will, Somaliland representatives participated in a conference on postconflict reconstruction in Somalia that was hosted this week by the Wilton Park Conference organization in West Sussex, United Kingdom. Until 1990, Somaliland had suffered from conflict, civil strife and subversion, maladministration and neglect – all the ingredients supposed to create a “failed State”. In 1991 Somalialnd has finally decided to end the non-functioning Union with Somalia which was inevitable; and the usual predictions did apply to Somalia/Mogadishu as the country was picked on by warlords, bandits, extremists of various sorts. 20 years of internationally assisted negotiations have solved none of these problems. Thank you for inviting me as the Foreign Minister of Somaliland to participate in this international conference in order to share our experience in piece-making and state-building with you in the search for piece and security in Somalia. Waa Xus iyo is dul-taag, halgankii jaadadka badan lahaa ee Muj, Ib. M. Samatar ugu jiray dalkiisa iyo dadkiisa (ahun). Aamiin. Madaxweyne A.M.M ' siilaanyo' iyo khudbadiisii u horaysay ee uu Golayaasha u jeediyo...(audio). Wasiirka arimmaha gudaha ee Somaliland, Dr Gaboose. Allah ha u naxariisto isaga iyo adoomahiisa muslimka ah-ba. Aamiin. 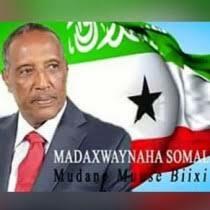 Mujaahid Ibraahim Maygaag maxaa uu ka yidhi burburkii Soomaaliya ' waxii la isku odhan jiray'?...... Dhegta Maal! Akhri oo ka bogo, Qoraalkan uu ku muujinayo talooyinka, taariikhiga ah iyo weliba halka uu go' aanka mujaahid Ibraahim Maygaag taagnaa marka laga hadlayo Somaliland. Allah ha u naxariisto.